In a time when the term “adventure game” incites visions of either hilarious LucasArts classics or modern dialogue-based titles from Telltale, we’re fortunate to have Amanita Design on our side to keep things interesting. 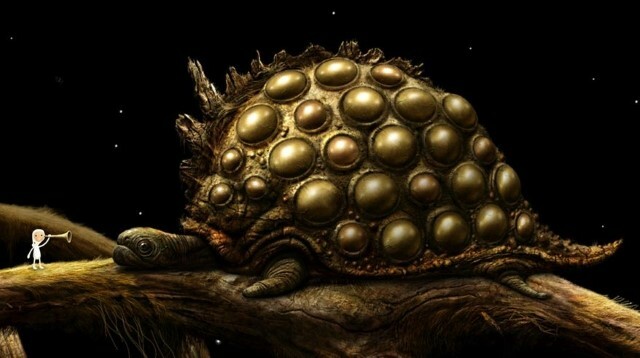 Samorost 3, their first full-length entry in the long-running series, is unique in just about every imaginable way, and a notable departure that doesn’t really tick many of the traditional genre boxes. As in the previous games, you play as a gnome living on a beautiful but ramshackle planet inhabited by creatures both familiar and fantastic. And while you’re not the only intelligent being on this world, you won’t be doing any talking. Everything here is expressed through grunts, gestures, and visual representations of ideas. In fact, there’s not a single spoken or written word in the entire game. Your interaction and exploration of this world ends with simple clicking and dragging, but complex gameplay mechanics are not the compelling draw of this title. The world of Samorost 3 is an enticing mix of natural beauty and discarded rubbish that poses some interesting ideas about the nature of the game’s world. One minute you’re wandering through a lush green forest, and the next you’re exploring a junkyard full of broken and maligned objects from our real world. You’ll explore planets made of driftwood and lava and traverse moons made of stone and leather. The world doesn’t just impress with its visuals. A large part ofSamorost 3 involves your interaction with sound and music. In fact, the most pervasive gameplay mechanic is your use of a trumpet that serves as both a listening device and musical instrument. Many objects in the world emanate sound that your character can skillfully play back in order to interact with them. But these interactions make up only a portion of the beautiful auditory experience. The sweeping and ethereal soundtrack by Czech artist Floex is astounding and worth listening to even outside of the game. The music is often expressed as part of the game world, acting as an anthem for its various characters to dance and sing along to. 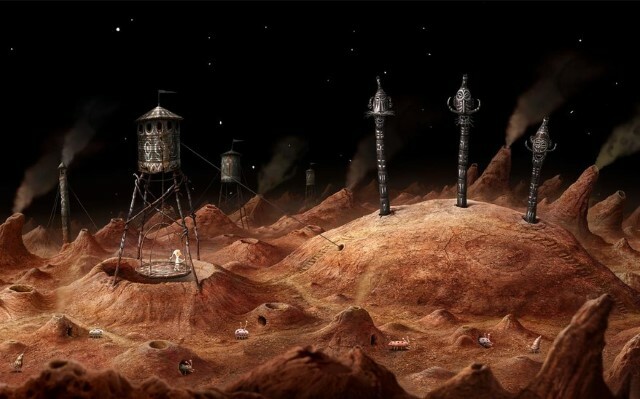 The powerful aesthetics of Samorost 3 at times suggest the remains of an ancient civilization with a rich history, but these are only glimpses of a story that might have been. Shadows of a traditional narrative structure start to develop over the course of the game, but there’s little in the way of driving force to keep you moving and exploring the environment. There’s no spark that sets you off on your quest and there’s no real given reason to explore at all. And rather than set you down in a world where you’re free to do that exploring, you’re limited in how far you can venture until you encounter environment puzzles and inventory-based tasks. Fortunately, these tasks remain varied and largely interesting throughout the course of the game. You’ll encounter puzzles that require you to use logic, spatial reasoning, common sense, memory, sound, and visual cues. While a handful of puzzles have shared DNA, no two are exactly alike, so you won’t get bored solving the same filler tasks over and over. Several of these puzzles require clever use of your environment and manipulation of the world’s lush ecosystem. You’ll be interacting with birds, bugs, and flora of all kinds to move you throughout the world and get closer to your unstated goals. The game is at its best when it encourages you to use your brain rather than your inventory. Unfortunately, there are a few missteps as well. One of the earlier puzzles, for instance, involves tracking down parts to a roughshod spaceship that you’ll use throughout the course of the game. But instead of giving you a freeform path towards this goal, there’s a specific task that must be completed before all the others. There are also a few instances in the game where you’re presented with an inventory item that you can’t pick up until the game deems it the right time. This was especially frustrating since it was so obvious to me that I would need those inventory items later… so why force me to backtrack? With Machinarium and the previous Samorost entries, Amanita Design has shown that they clearly understand the adventure genre, which makes the inconsistency in Samorost 3’s puzzles even more baffling. These few weak points would be more forgivable if they were buried under heaping mounds of great puzzle-solving, but the game’s short playtime doesn’t offer quite enough good to offset the bad. In the end, it’s hard to recommend Samorost 3 as much more than a curiosity. The few great puzzles barely outweigh the frustrating ones, and by the time you feel like you’re just getting started, the journey is over. The most interesting part of the game is definitely its handcrafted world, but I just wish I had a reason to explore it for longer.